Hello programming friends, it’s Andy Gesner and the staff at HIP Video Promo bringing you another mindbending clip from one of our all time favorites, Yeasayer. Hiring an A-list actress as your lead role can often act as a double-edged sword: she can either end up being a distraction to the music at hand or, if the job is done right (and she can actually act), the story being told will be at the forefront of it all. Yeasayer obviously did the right thing with their latest video “Madder Red” when they hired the talented Kristen Bell to take on the lead role. Bell has a long list of accolades – from Veronica Mars, the TV series that got her first noticed, to the hit comedy film Forgetting Sarah Marshall. Actually, she’s not one to duplicate roles, so it’s no wonder she played the part of a distraught pet owner in Yeasayer’s video flawlessly. At its core, “Madder Red” is a heartbreaking video that chronicles the tight relationship between Bell and her sick “pet” up until its dying moments. It’s easy to get distracted at first with the cryptic, one-eyed monster ohh-ing parts of the song while it coughs up blood, but Bell does not let its repulsive nature faze her (think Krang from Teenage Mutant Ninja Turtles). Whether she’s leaving a casting call to run home to her pet or tearing up as it get’s operated on in the ER, Bell expresses her unwavering love for it through and through. No mater how you feel about the attractiveness of her pet, the clip will undoubtedly hit close to home for many people. The video for “Madder Red” has already become a massive viral success on the internet thanks to it’s premiere on UK’s biggest paper The Guardian (guardian.co.uk) and Pitchfork.com as well as sites like # SPIN.com and NYMag.com’s Vulture blog. This seems to be the trend with Yeasayer as it’s been a big 2010 for Yeasayer, thus far as the previous videos we’ve promoted for them – “Ambling Alp” and “O.N.E.” – have been huge hits on the programming circuit, and the band was noted as a can’t-miss act during this year’s Coachella. Yeasayer also has the solid reputation of already being favored darlings at MTV. When Yeasayer’s second album,ODDBLOOD, was released earlier this year, MTV (in addition to Rolling Stone, SPIN and NME) lauded the release, noting that it is “wavy, dreamy pop music for the 22nd century” and that “Britney, Katy and Gaga wish they could sound this good.” You can also just look at the numbers: Yeasayer’s album peaked at No. 63 on the Billboard 200 and has also dominated the Rock, Digital, Independent, Alternative and Tastemaker Album charts. Thank you so much to the folks over at Secretly Canadian for teaming up with HIP in order to get another unforgettable Yeasayer video out there. The release of “Madder Red” times perfectly with Yeasayer’s fall tour, which kicks off at the Virgin Mobile Festival in late September. If you need more info, call Andy Gesner at 732-613-1779 or e-mail us at info@HIPVideoPromo.com. 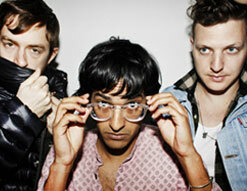 You can also visit www.SecretlyCanadian.com or www.Yeasayer.net to find out more about Yeasayer.